Kerry made it five Munster SFC titles in a row after encountering little resistance from arch rivals Cork in front of 31,836 in Killarney as they romped to an 11-point victory. The Kingdom were on top throughout and cruised to victory with ten different players finding the target as they brushed the Rebels aside with ease. The were well on their way to their 79th Munster title when they led by 0-11 to 0-07 interval lead having played against the breeze at Fitzgerald Stadium. Cork badly needed a good start to settle themselves after a shaky championship campaign so far, but the Kingdom hit them hard from the outset and raced into a 0-04 to 0-00 after just four minutes. Paul Geaney was rampant in those opening minutes, shooting a couple of points and setting up his cousin Mikey for a fine score, with James O’Donoghue also hitting the target. Cork, who hit seven wides to none for Kerry in the opening half, had chances to cut the gap but were off target until Mark Collins eventually got them off the mark after eight minutes. The Kerry response was swift with O’Donoghue and Anthony Maher extending the lead to 0-06 to 0-01 after eleven minutes with good scores. Cork midfielder Ian Maguire did a lot to rally the Rebels and it took a good save from Kerry custodian Brian Kelly to block a goal chance, but Collins followed up with his second point. O’Donoghue and Paul Geaney landed frees from opposite sides for the champions before Cork enjoyed their best spell of the opening half. Niall Coakley, a late replacement for Colm O’Neill, pointed a free from the right and then added another after Maguire also scored, to cut the gap to 0-08 to 0-05 ten minutes from the break. It took a good save from Cork goalkeeper Ken O’Halloran to deny Paul Geaney after the Rebels’ defence was carved open with a good passing movement. O’Donoghue and Luke Connolly exchanged points and then Kieran Donaghy, from a goal chance, and Tomas Clancy did likewise, but the Kingdom had the final say of the opening half when Paul Geaney got his fourth of the game. Kerry killed off the contest by starting the second-half with five points without reply with interval substitute Stephen O’Brien kicking two of them and David Moran, O’Donoghue and Paul Murphy also turning the screw. Indeed, 42 minutes elapsed before Kerry hit their first wide when O’Donoghue was off target but by then the game was over as a contest. 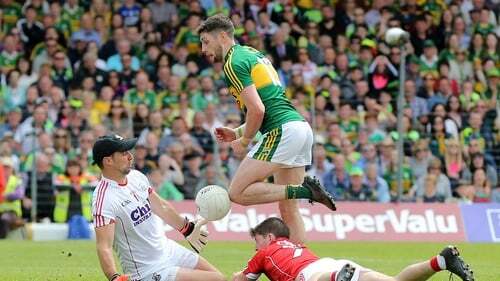 The introduction of Donnchadh O’Connor injected some potency in the Cork attack and the 36-year old kicked six points in the second-half, four of them from play. Paul Kerrigan had a goal chance saved by Brian Kelly but Paul Geaney wrapped it up at the other end when he bundled the ball over the line for the only goal of the match after 64 minutes, after play was held up for several minutes following a head injury to Kerry’s Fionn Fitzgerald, but that was the only blip as they continued their dominance in Munster. Kerry: B Kelly; F Fitzgerald, M Griffin, S Enright (0-01); P Crowley, T Morley, P Murphy (0-01); D Moran (0-01), A Maher (0-01); M Geaney (0-02, 0-01 ’45), K McCarthy, D Walsh; P Geaney (1-05, 0-01f), K Donaghy (0-01), J O'Donoghue (0-7, 0-04f). Subs: S O’Brien (0-03) for Walsh (36 mins), K Young for Fitzgerald (46 mins), J Barry for Maher (59 mins), BJ Keane (0-01) for O’Donoghue (63 mins), D O’Sullivan for Donaghy (65 mins), J Lyne for M Geaney (66 mins). Cork: K O'Halloran; J Loughrey, J O'Sullivan, S Powter; T Clancy (0-01), M Shields, K Crowley; A Walsh, I Maguire (0-01); R Deane, M Collins (0-02, 0-01f), K O'Driscoll; N Coakley (0-02, 0-02f), L Connolly (0-02, 0-01f), P Kerrigan (0-01). Subs: D O’Connor (0-06, 0-04f) for Coakley (36 mins), A O’Connor for Deane (39 mins), C O’Driscoll for Shields (44 mins), M Hurley for K O’Driscoll (45 mins), E Cadogan for O’Sullivan (63 mins BC), S Cronin for Loughrey (63 mins).